Fatah rejects Trump's peace plan, calls for "popular resistance" against the "occupation and its settlers". The Fatah Revolutionary Council on Sunday declared its support for its “President” Mahmoud Abbas and his political outlook and warned against attempts to undermine Palestinian legitimacy. Following a meeting at Abbas’s headquarters in Ramallah under the title "Al-Quds, the eternal capital of the State of Palestine," the Central Council noted that the recognition of Jerusalem by the American administration does not create any new legal reality and that “the occupied city of Jerusalem will remain the eternal capital of our state. We reiterate opposition to any attempt to detract from our right to it." The Council also called for the convening of the Palestinian National Council (PNC) as soon as possible in order to renew the Palestine Liberation Organization’s (PLO) national legitimacy as the sole representative of the Palestinian people and to activate the institutions of the organization. The resolutions of the Central Council supported the escalation of the popular resistance against Israel in the confrontation with the "occupation and its settlers," a ban on work in the “settlements” and the boycott of Israeli goods. 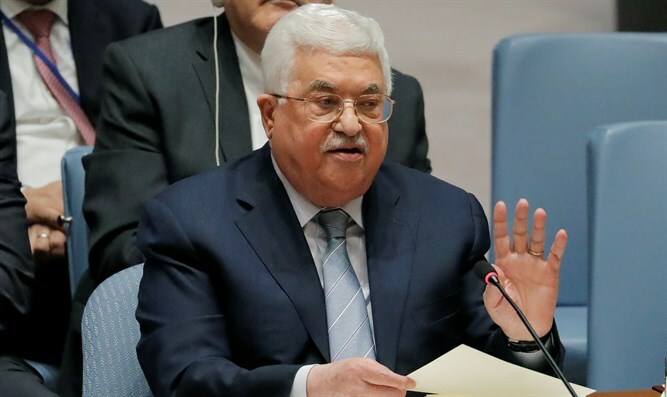 At the start of the meeting, Abbas said that the American political initiative known as the "deal of the century" is consistent with the Israeli approach. He stressed the importance of creating a new international mechanism for the diplomatic process based on international legitimacy. He recently addressed the UN Security Council and called on the international community to hold a Middle East peace conference as an alternative to a U.S.-led talks between Israel and the PA.
Last week, the Arabic newspaper Asharq al-Awsat published what it said were the details of Trump’s peace plan, though it cited unnamed French officials as its sources. Those officials told the newspaper that the American president will present a diplomatic plan including recognition of a Palestinian state not based on the pre-1967 lines, while the Jordan Valley will remain in Israeli hands, the Palestinian Arab demand for a "right of return" will not be implemented and the "Palestinian refugees" will be compensated and remain where they are. The alleged plan also states that the large Jewish communities in Judea and Samaria will remain in place but some of the smaller communities would be evacuated. The Palestinian state would be demilitarized and have limited sovereignty. It includes the transfer of other security and administrative responsibilities to the Arab authorities in Areas A and B. The capital of the Palestinian state would be in eastern Jerusalem. The PA official in charge of foreign affairs later said some European Union countries would negotiate with the United States to persuade it to amend its peace plan.